For my project I chose to curate an exhibit of the evolving relationship between music & YouTube. Everyone knows that each have been affected greatly by the other but I wanted to explore what exactly has changed to both over the years. “Music” is a very broad thing. So without getting all “John Cage” on you – this exhibit will focused a few core areas of music, and their subtopics, on how they’ve been affected by YouTube. The exhibit covers how the following have been affected: live music, the music industry, the history of music, & the education of music. First and foremost I wanted to enjoy doing this project. The topic selection and types of projects we could do were very open which was very refreshing. I knew I wanted to do a digital project so I could build some sort of skill and also cover a topic that was interest of me and probably wouldn’t cover in another class. Spurring from the “Machine is Us/ing Us” video that I covered during the course my idea for covering music began to develop. The video hinted about how we must rethink certain things that we know; one of them was copyright. Having down research on the topic in the past I knew I wanted to reopen the topic and explore how it’s changed since them but also go deeper into the topic of music specifically. A lot of the topics I cover I feel use examples that most people would be able to understand. If I were to continue work on the project I would hope to cover more of the niche of music that I personally enjoy. For the topic I wanted to also make sure that it was one that covered an emerging technology that I was interested but also had an element of history to it of course. In many other courses the bulk of the content was on the past and current events were just given a small amount of attention. So with my topics I wanted to make sure to cover news that was fairly recent as well. Overall I tried to make the topics as broad as possible but used case studies to bring it into context. Moving forward I would probably like to do more posts involving current events as they happen. The platform I used was WordPress and my goal for that platform was just to gain a basic understanding of its use. Building off the practicum that was held during class I wanted to simply recreate what we learned and possibly go a little more in detail with the site. Using a free WordPress blog you sort of max out the options that you may apply or tweak with the site. Fortunately I also obtained a WordPress.org paid website that let me go into WP even further that what I planned. Through this I was able to understand the difference between the two better and see the pros/cons of both. In then end I tried to cheat the system and present my WP.com blog as a WP.org web page and the end result I believe is okay. Towards the end of the project I also tried to experiment with the format with some of the pages in the exhibit. I didn’t want each piece to just be a wall of text and wanted to make the experience a little more interactive. In the end, as I mentioned before, the main goal was to create something that would push people to think about the topics covered. Hopefully they would gather my opinion, think about theirs, go out and read more on the topic, and continue to develop how they felt. I wanted to set up the site to make sure that process was as friendly as possible to go through. I tried to include not only links & other content to what I was directly talking about but to other sources that would help give further incite or overview on similar topics. My print project on Watergate proved to be rewarding in a number of ways. First and foremost, for someone who is extremely fascinated by this particular scandal, examining some of the public’s comments about it on various blogs and news websites challenged me to re-evaluate some of my own ideas about this important moment in U.S. history. It was really interesting for me to see how the public’s ideas about Watergate compare and contrast to what scholars say about it. (For instance, the convention wisdom among many scholars is that Watergate continues to affect U.S. politics today, but a large number of people made thoughtful comments online about why they think it doesn’t really matter anymore.) Before I started this project, I assumed that most Americans agreed with this conventional view because, to me, the numberous ways in which Watergate continues to touch politics are quite obvious. But the comments that various people made online made me realize areas where I need to strengthen my argument in order to defend my belief, which will be quite helpful for my future research. Additionally, this project (and this course in general) have made me think about what qualifies as a “legitimate” historical source. It made me realize that as I continue my research, it is perfectly acceptable (and even beneficial) to count blogs and other digital media as quality sources. Especially since blogs, Facebook and Twitter have essentially replaced traditional journals and letters as people’s means of self-reflection and communication with others, the Internet can provide a wealth of insights that historians may not otherwise be able to find and utilize. As far as my project itself goes, I can’t pinpoint what I would change about it. It is not a perfect project by any means, but it satisfied my goal of learning a little bit about how public memory compares to scholarly memory. I don’t think that I’ll carry on with this particular project but, as noted above, it will certainly help me with further research, even if only indirectly. I do think this project could have been stronger if I figured out how to tighten up my methodology. To find comments, I did a google search and combed through the top twenty websites that popped up so that I wasn’t simply scouring hundreds of sites, looking for the one or two comments that pertained to my project. In some ways, this method still seemed inadequate and faulty. But I still think it was sufficient enough to help me fulfill the goals I had for this project. Overall, I am happy with my paper and think that if I continued working on it and tightened it up, some of my findings could potentially be useful for digital scholars as well as historians. 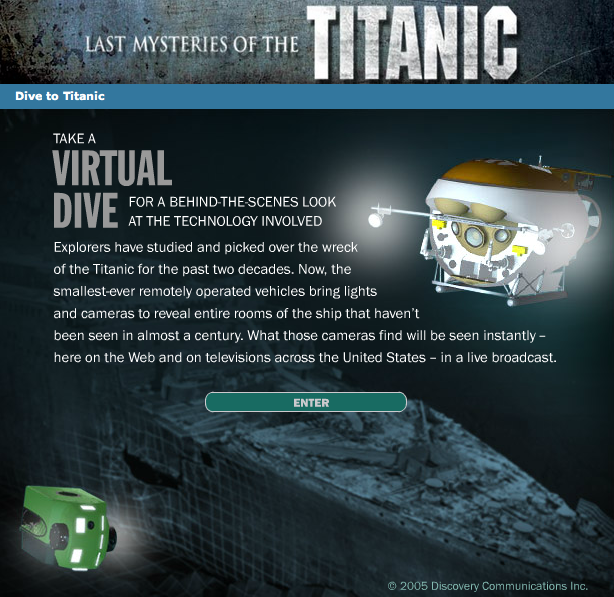 The Virtual Dive of the Titanic on the Discovery Channel Site allows viewers to explore the technology surrounding the dive down to the Titanic ruins. 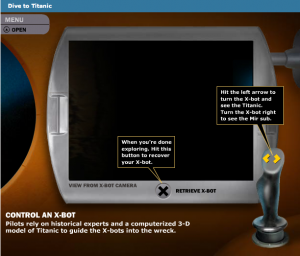 It is a good tool with a lot of information, but doesn’t give much background on the Titanic or allow you to explore the wreck itself. 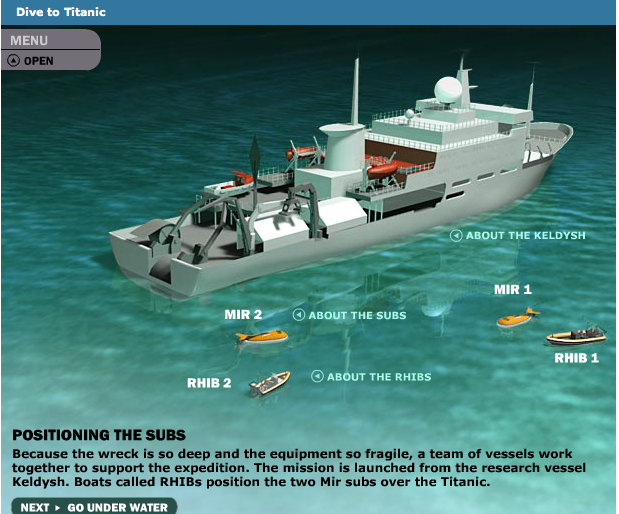 The introduction allows you to explore each vessel used in the dive process. 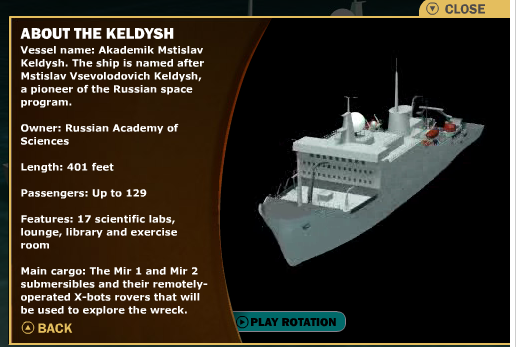 By clicking on the ship, the floats, and the Mir diving pods, the user can learn more information on each. Then you are ready to proceed to the dive. You fill the sub’s ballast tanks to add weight to the Mir 1 and Mir 2 in order to dive. The dive is in the perspective of the Mir 2, looking out over the Mir 1. 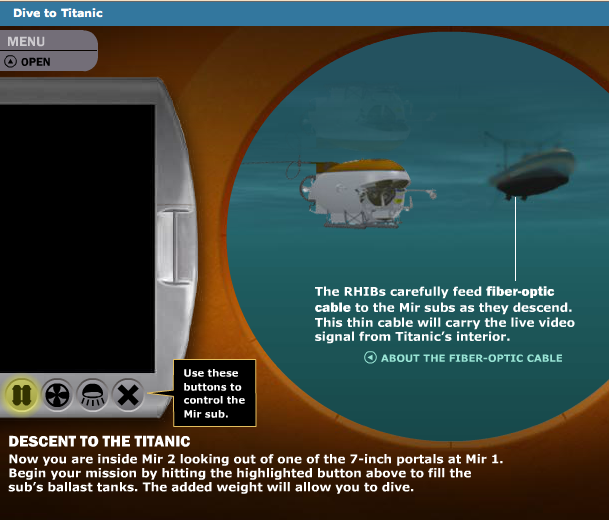 The virtual tour allows you to explore the fiber optic cable that attaches the subs to the ship. It event provides a diagram that compares the width of the cable to a pencil eraser. 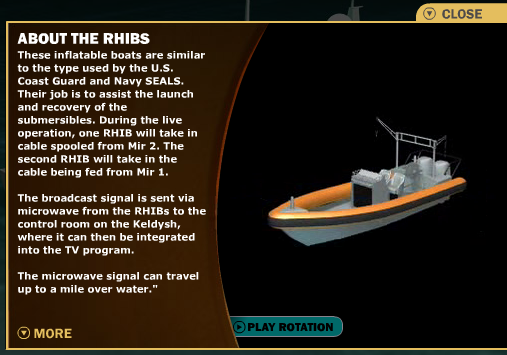 Next, you have to engage the sub’s thrusters to begin a slow corkscrew descent (100 feet-per-minute to the sea bottom). The view from the portal is now completely dark as we are now virtually 800 feet below the surface. The external lights are off in order to conserve battery power. On the side, we see our depth in relation to the Empire State Building (40th floor). We continue to dive by using the thrusters until we reach 3,000 feet (over two Empire State Buildings). The dialog on the bottom of the screen tells us that the cabin temperature is 54 degrees. Finally, we reach the bottom at 12,600 feet (10 empire state buildings) after two hours and the external lights are turned on to explore the wreck. 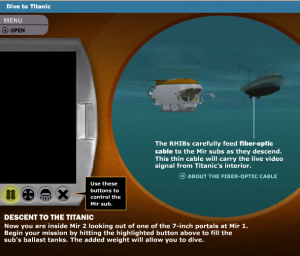 We can now read about the wreck or the safety concerns of the fiber optic cable. The wreck information is incredibly extensive. It is focused on the wreckage itself, with only one sentence introduction about the voyage and sinking. I didn’t know that the National Oceanic and Atmospheric Administration have reported the wreck will most likely collapse within the next 50 years. 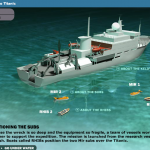 It also discusses the guidelines they released in 2001 for research, exploration and salvage of the ship to preserve the wreckage as long as possible (which are not legally enforceable). Next, the information reveals more about the corrosion and deterioration of the wreck including scientific reasoning for deterioration and how humans have interacted with the wreck, what they’ve left behind and what they’ve removed. You deploy the X-bot rover (which you see through the small portal window) and can control it using a joystick on the screen. 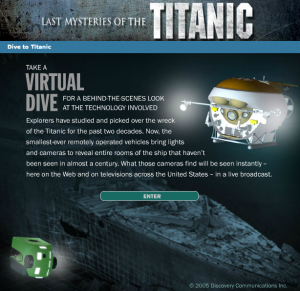 The pilots relay on historical experts and computerized 3-D model of Titanic to guide. However, you only get one view of the wreck. There is no ability to look at different parts of the ship. 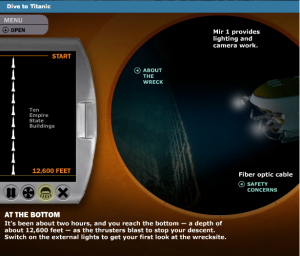 The Virtual Dive tool was initially created in 2005 in anticipation of the live broadcast of images from a live dive that year. It is a very informative learning tool and easy to use. 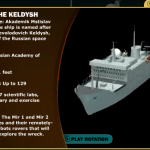 However, I think it would have been served with a little more flexibility in the exploration of the ship and more images of the wreck itself. 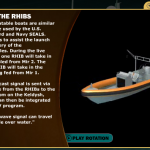 I can see how this keeps the focus on the technology used for the dive, but it ended up being disappointing because there was really no point to giving the user control over the pod when there is only one view you can see. Taking the viewer step by step on how the technology is used is definitely beneficial. Especially to young learners. I came across an interesting site hosted by PBS. “The Video Game Revolution” offers a lot of neat facts about video games. The site is apparently a companion to a PBS documentary by the same name. 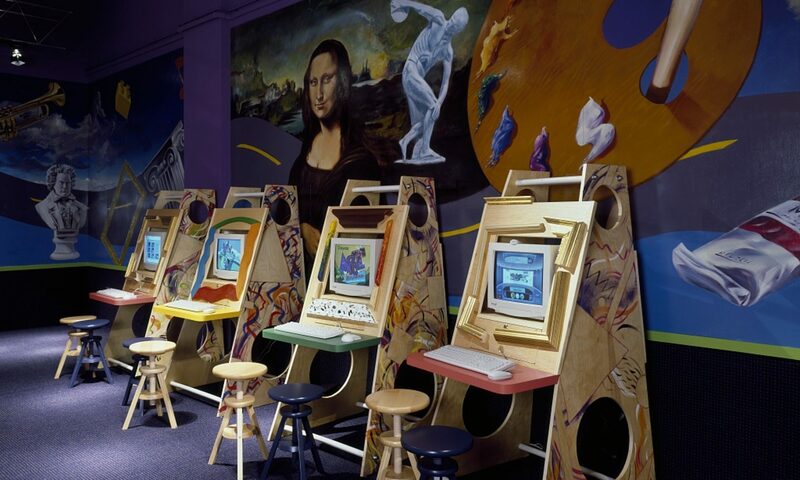 The site discusses the evolution of video games, how they are made, how video games influence our culture, and much more! It even includes a “cheat” section that offers clues about how to do well in certain classic games like Pac-Man. Two of the parts I really like are the “Essays” and “Additional Reading” sections, which are found under the “Impact of Gaming” tab. Both of these sections offer insightful, thought-provoking readings that often speak about the stereotypes associated with gaming. For example, Aleah Tierney’s article “What Women Want” describes how women relate to video games, and how they are portrayed in them. Usually, we think of women as being disassociated from video games; most players, according to the stereotype, are teenage boys. Tierney admits that most players are indeed young men, but points out that a growing number of women play games too. Moreover, she says that some female characters are simultaneously depicted as attractive, sexual beings (who fulfill mens’ fantasies) and strong warriors, who represent how women are not always meek individuals who depend on men to rescue them. (See Tierney’s article.) Although this article is brief and does not thoroughly flush out a lot of the issues it brings up, it does raise some interesting points that could potentially spark further discussion. Additionally, Henry Jenkins’ article “Reality Bytes: Eight Myths About Video Games Debunked” seeks to do exactly what the title says. According to the site, Jenkins is a MIT professor, and he tries to shoot down various myths associated with video games, ranging from the idea that games lead to more violent youth to the idea that kids are the only age group that play these games. (Like Tiernan, he also rejects the notion that girls do not play video games.) Again, this article is brief and Jenkins does not fully analyze all of the ideas that brings up, but his ideas do challenge the conventional way that we think about video games. I think this site provides a nice follow-up to the class discussion we had, as well as to the other “Show & Tell” posts that pertain to gaming. I encourage anyone who is interested in gaming to check it out! At the suggestion of Professor Owens, Shaping the Nation now has source code hosted on Github as kmlmap. I don’t have a license selected for it — I believe the existing licensing of the projects it’s made of will determine whether it’s GPL/MIT/WTFPL licensed. In the next couple of days, I’ll be adding documentation and usage examples at chrisdroukas.github.com/kmlmap. If you’d like to play with your own hosted version of Shaping the Nation, head over to Github, download the ZIP archive and deploy it to your host of choice.